Google was one of the first companies to deploy AMOLED displays in their smartphones. While they were made by partner companies, the Nexus One, Nexus S, and Galaxy Nexus all used AMOLED displays. The Nexus One actually shifted to LCD midway through its lifetime, although it was mostly due to supply issues rather than concerns about quality. When the production of Nexus smartphones was taken over by LG during the time of the Nexus 4 and 5, the devices moved to LCD displays. From a cost perspective this made a great deal of sense, as those devices were all very aggresively priced and using LCD displays helped in bringing down costs. With the Nexus 6 Google went back to AMOLED again, and for the Nexus 5X and 6P there was a split between LCD on the 5X, which was made by LG, and AMOLED on the 6P, which was made by Huawei. With the Pixel and Pixel XL being the first phones being branded as purely Google, the choice of display technology is a good indicator of where Google feels the market is headed. In this case there's no need to make any concessions to drive down price, and because of that, Google has decided to go all in on AMOLED. The smaller Pixel has a 5.0" AMOLED display with a resolution of 1920x1080. The larger Pixel XL that I'll be examining here is a 5.5" 2560x1440 AMOLED display. These are the same specs as Samsung's Galaxy S7 Edge minus the curved edges, so that will be an interesting point of comparison. Both models of the Pixel have a sufficiently high resolution, and I think it's worth stating again that opting to go with a 1080p display on a 5.5" phone is the wrong decision if you're shipping a PenTile AMOLED display, because your chroma resolution is reduced. Google has definitely made the correct decision in that regard by going with 1080p on the smaller model, but moving to 1440p on the larger one. 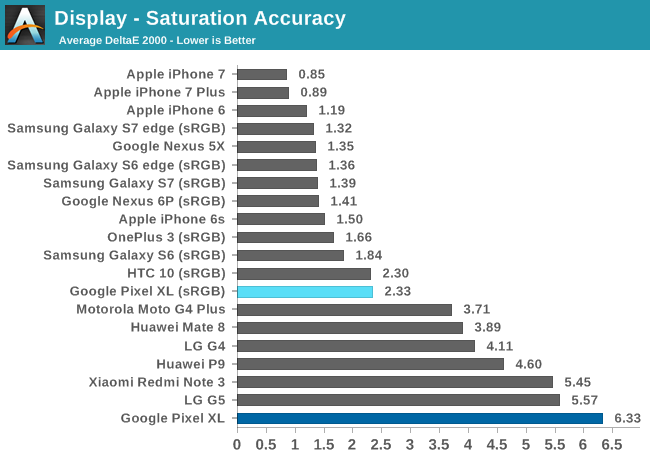 Meanwhile, as smartphone manufacturers are starting to look at wider color gamuts, Google is no exception. Both versions of the Pixel ship with an AMOLED display that (oddly) supports the NTSC gamut, and defaults to using that gamut. We'll get into the guts of how this works and the tradeoffs involved, but importantly, the phones also support being put in the more standard sRGB mode, which clamps the gamut to the afformentioned standard. This adds another facet to our testing, especially given the pros and cons of using the different gamuts. Ultimately a display has many factors beyond resolution, and evaluating displays in an objective manner requires each of these properties to be measured and compared to a common standard. In this case, we use the sRGB standard which is the standard color space for all content on the web, and for essentially all computers in general at this time. Measurements are taken using an X-Rite i1Pro 2 spectrophotometer and compiled in SpectraCal's CalMAN 5 software. The Pixel XL's peak brightness is on the lower side, topping out at 403 nits. 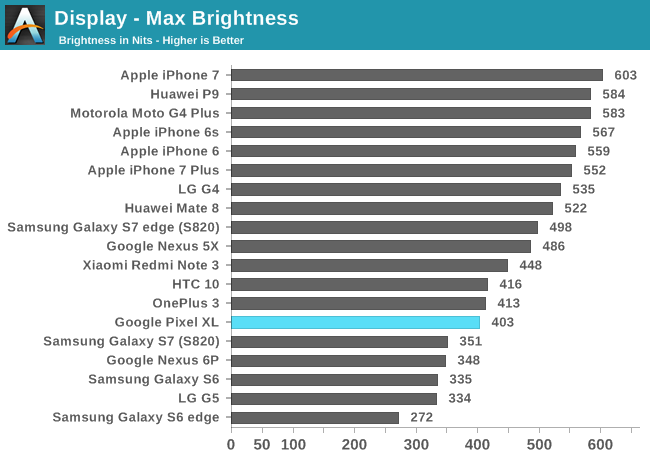 This is higher than the Nexus 6P, but not as high as the best we've seen from AMOLEDs on Samsung devices where the displays can reach nearly 500 nits in manual mode. Competing LCDs can go even brighter, with many being able to sustain a manual brightness of 550 to 600 nits indefinitely. The larger issue here is that Google provides no boost mode when the phone is set to automatic brightness. Samsung does this on their AMOLED devices, and other vendors have begun to offer the same sort of feature on LCD displays. This means that in bright ambient lighting, other devices will reach anywhere from 600 to 800 nits in order to maximize visibility, while the Pixel XL will remain at 403 nits. The OnePlus 3 is another example of a recent AMOLED device without a boost mode, and at $399 I considered it acceptable, but with the Pixel XL's starting price of $769 I really don't know what Google's excuse is for being so far behind the competition here. While the Pixel XL doesn't fare well when you look at its brightness, the use of AMOLED displays means that you get perfect black levels and an essentially infinite contrast, although one does have to consider that reflections from ambient light generally prevent that theoretical contrast ratio from being realized in practice. Even so, when put next to a standard LCD the Pixel XL's black levels make the LCD's deepest possible blacks look like light grey in comparison. The greyscale situation on the Pixel XL is actually quite interesting. In both cases Google has a relatively straight gamma, but the default NTSC color mode is slightly blue-shifted, while the sRGB mode is lacking in blue, and actually shifted a bit toward green. The overall error level is lower in the NTSC mode, and I would agree that skewing toward blue is better visually than skewing toward red, particularly because human vision is least sensitive to blue. The issue here is that the sRGB color mode will provide more accurate colors, but a less accurate greyscale. While you can't tell from the correlated color temperature average alone, if you look at the RGB balance for each greyscale shade in the sRGB mode you'll see that it's shifted toward red, but it also has too much contribution from the green component as well. Even slight skewing toward green has a profound impact on the appearance of greyscale shades, and I find the greyscale reproduction in the sRGB mode is very unpleasant. With the OnePlus 3 side by side it's clear that they're both warmer than the target of D65, but the OnePlus 3 is still looks like white, while the green-shifted Pixel XL looks quite ghastly. Having the bulk of your error come from hue and chrominance instead of luminance is not a good way to go, and I'd say that the Pixel XL misses the mark on greyscale accuracy in its sRGB mode. The NTSC color mode is just a disaster for saturation accuracy, although it's that way by design. Targeting a wide gamut is the wrong way to go on Android because the OS is not color aware, but if a company feels the need to offer a wide gamut mode it should at least be a gamut that is actually used for consumer content instead of an ancient, irrelevant gamut from the days of analog television. What really shocks me is how Google has gone so far backward from the days of the Nexus 5 and Nexus 7 (2013) where its devices were shining examples of how to make a mobile device with a great display. 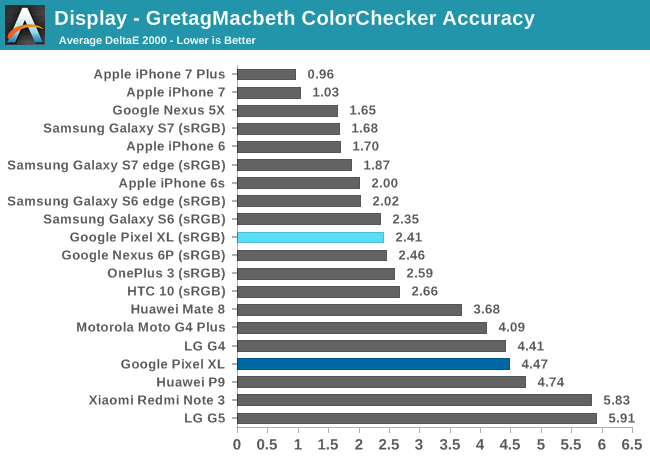 Thankfully, the sRGB mode is quite accurate, although heavy competition in the smartphone market means that it's still in the bottom half of the chart despite its accuracy. The only thing you could really complain about is that blues are a bit farther off than they should be, and 100% saturations for red, blue, and green fall a bit short as well. This is just nitpicking though, and I don't think anyone will have an issue with the accuracy of primary and secondary colors when using the sRGB mode. The GretagMacbeth ColorChecker follows the same trend as the saturation test. In the NTSC color mode the error is relatively high, with many colors actually falling outside the sRGB gamut. Not surprisingly, chrominance errors constitute the largest portion of the overall error for each color mixture. The sRGB mode brings the errors under control, and the only colors where the error is a bit concerning are the blue shades, which makes sense given that the greyscale is deficient in blue which leads to the issues in rendering pure blues of varying saturation, as well as color mixtures with significant blue color components. 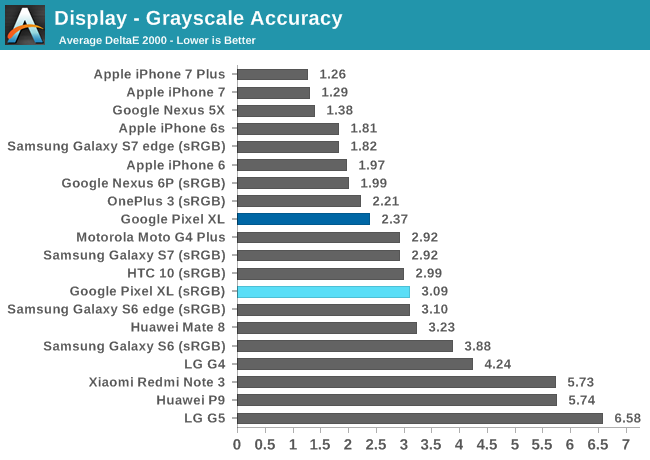 One again, despite the good level of accuracy, the Pixel XL is actually just in the middle of the chart due to many devices with exceptional accuracy shipping in recent times. The AMOLED display on the Pixel XL is a very high quality panel. I would say it's at least as good as the Nexus 6P, and further investigation into power usage may show that it's actually improved in that regard due to improvements in emitter efficiency in the past year. As far as color accuracy goes, both color modes have their own issues. The NTSC color mode is clearly not going to have a good level of color accuracy relative to the sRGB standard, which makes sense given that the gamut has completely different chromaticity values. I would like to reiterate that nobody who actually understands color and the color standards used today would ever choose the NTSC gamut, and I'd really love to know if it was actually something Google decided or if this is just how panels are coming from AMOLED suppliers. The sRGB mode is very good for color accuracy, although as I mentioned earlier, being really good as far as an objective analysis goes now means your accuracy is just decent relative to the competition. Realistically, I think the color accuracy on the Pixel XL is more than sufficient for any users. The only issue is that the greyscale exhibits significant green shifting. This is a big problem, and it's enough to make the sRGB mode unpleasant to use because the white background of the app drawer, apps, and web pages has a sickly green hue. The NTSC mode is skewed toward blue, but it's much less distracting than the sRGB mode's skew toward green. Unfortunately, using the NTSC mode means you have to deal with inaccurate colors. For me, both color modes have at least one significant problem that negatively impacts my experience as a user. It's enough of a problem that I don't enjoy the Pixel XL's display because I'm used to devices like the OnePlus 3 and iPhone 7 which have accurate greyscale and color rendering. I believe that I'm more sensitive to this than most users because I'm coming from devices that are very close to the sRGB standard so I have that point of reference. Even so, as far as an objective display evaluation goes, I'd have to say that the Pixel XL has a very high quality display, but neither color mode is quite as good as what you can find on competing devices, including some that cost significantly less than the Pixel XL.